In the deserts of Sudan & the gardens of Japan, from Milan to Yucatan every woman, every man, drives an SUV, or so it seems. The original JEEP that saw the US Army through WW2 has evolved into a myriad of models, all proporting to be capable in urban areas & great off-road. Step forward the Jeep Compass, newly launched into the mid-range SUV market. The Compass faces stiff competition from hordes of two -wheel-drive competitors, such as the Nissan Qashqai, Peugeot 3008 & SEAT Ateca. 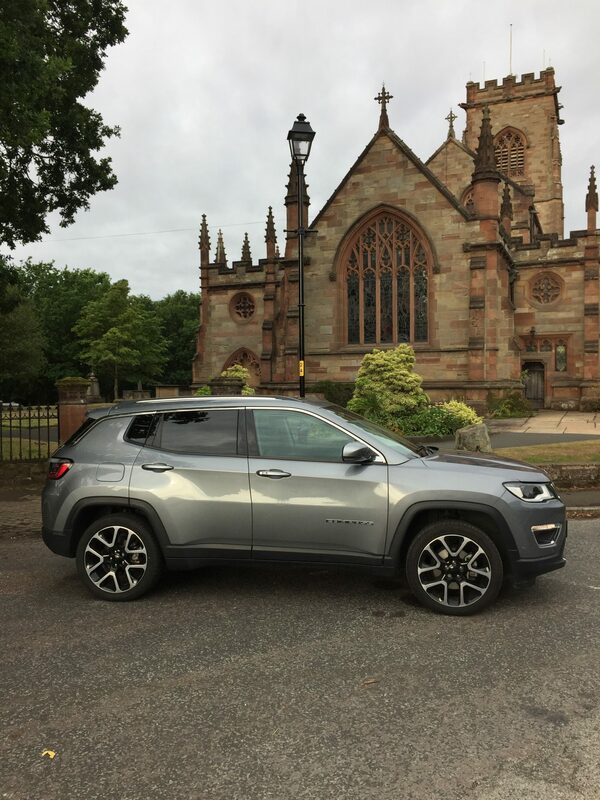 Whilst the more expensive 2.0 litre diesel’s off-road credential’s are first class, most UK customers never venture further than a muddy car park in their cars, so the good looking Compass will probably be most popular in 2WD as well & will like it’s smaller sibling the Renegade, appeal more to the urban warrior or school-run-mum. The range starts with front-wheel-drive, six-speed manual editions, equipped with either a 1.6-litre MultiJet diesel or a 1.4-litre MultiAir turbo petrol. If you want 4WD & a manual gearbox then you’ll need to go for the 138bhp 2.0-litre diesel. There are also a couple of nine-speed automatic 4x4s in the line-up, one of which we tested recently. 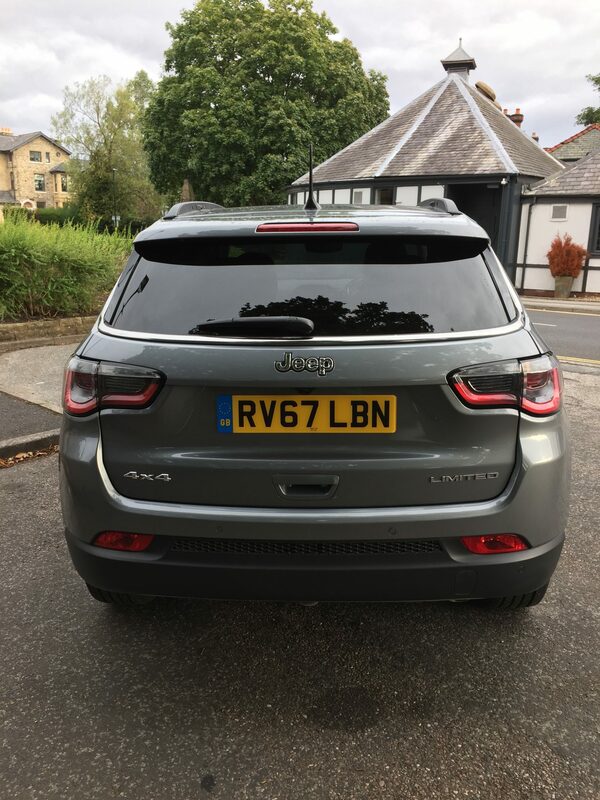 If your’e considering a Compass as an alternative to the usual suspects, Qashqai, Tiguan, 3008 or Karoq, there are four trim levels, starting with Sport, which gets 16″ alloys, air con, cruise control, a leather steering wheel & forward collision warning. Next up is Longitude with 17″ alloys, front fog lights, a reversing camera, dual-zone climate control, keyless entry & go, plus an FCA Group U-Connect 8.4″ infotainment display with Apple CarPlay & Android Auto connectivity. Our test model, the Limited is next up & features 18” alloy wheels, privacy glass, silver roof rails, LED signature lighting & tail lamps, power-folding mirrors with courtesy lamps, Keyless Entry’n’Go, Parkview rear back-up camera, Parksense front & rear parking sensors, Forward Collision Warning Plus, Lane Departure Warning Plus, Blind spot & Cross-path Detection & Parallel & Perpendicular Park Assist. 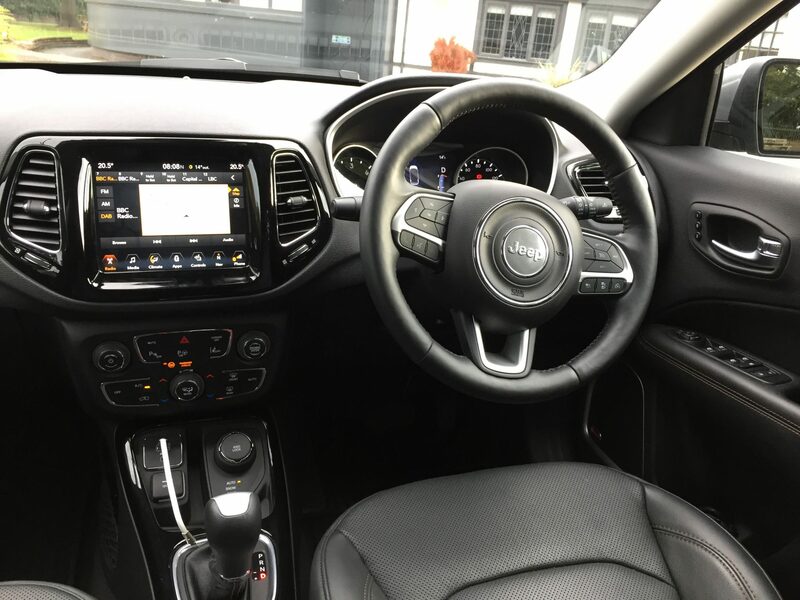 Inside, there’s a great list of spec with a 7” TFT Instrument Cluster, the aforementioned 8.4” U-Connect Navigation with DAB Radio, Bluetooth, USB & Aux-in, Apple CarPlay & Android Auto Connectivity, leather, 8-way powered & heated front seats, heated, leather-wrapped multi-function steering wheel, dual-zone automatic climate control & cruise control. Finished in Magnesia Grey we drove the 2.0 litre Multijet-2 170hp 4WD Auto Limited, which retails at £34,295. From the outside, the Compass is definitely attractive & at a distance, looks not too dissimilar to Volvos new XC40 amongst others. The Compass contains elements of the standard SUV that customers want. There’s plastic moulding around the wheel arches, a pair of black roof rails & plenty of ground clearance in case you venture off-road. Up front, the chrome front grille & Jeep logo dominate & it’s all finished of with some nice wrap around headlights. The rear by comparison is quite conservative with a large easy to reach handle to open the hatch & tidy rear light clusters. Inside, the quality is better than Jeep’s of old. Whilst everything falls easily to hand & is clear & concise for the driver, the dashboard is little busy, especially in a sector where buttons are fast disappearing. The cabin has soft-touch materials in abundance & the heating & ventilation controls, unlike the screen-based systems in some of the Compass rivals’, is controlled by good old fashioned switches. The central infotainment display is mounted high up, but looks a little small on the Compass dashboard The system itself though, works well with my long journey to & from London controlled perfectly by the built in SatNav system, which kept me informed of upcoming traffic problems & offered me alternative routes where congestion appeared. Interior space is good, especially in the front, whilst rear seat passages get plenty of leg room. Our test model came fitted with a panoramic sun roof, at an additional £1200, which eats into the head room available. Jeep have incorporated several cup holders into the cabin, along with decent sized door pockets & a useful between the front seats cubby hole with moveable lid to rest your left arm on top of on longer journeys. There’s both 12v, USB & Aux in input’s in the centre binnacle next to the 4WD system & another USB inside the centre armrest as well. I connected my iPhone via Bluetooth & utilised Apple Car Play during my week in the Compass & both worked really well, with the Beats Audio 9-speaker Hi-Fi being crystal clear on hands-free phone calls. The Compass boot offers up a variable-height floor, underneath which is a full size spare wheel, meaning the maximum capacity on offer is lower than it could be at 438 litres, which is a little more than you’d get in a Nissan Qashqai. With four adults & assorted paraphernalia in the cabin, plus four suitcases in the boot, there wasn’t a lot of spare capacity & we found the Compass a bit of tight squeeze. On the road, the 9-speed auto box works well & the Compass cruises brilliantly on the motorway. Although it will go from 0-62mph in 9.5 seconds’s it does feel a bit underpowered when you put your foot down & can get quite noisy as it moves up through the gears. 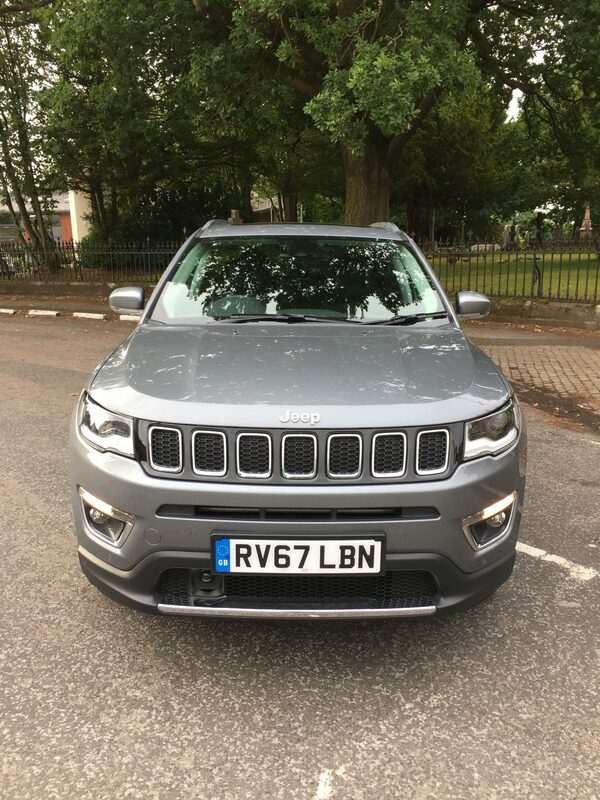 Once up to speed, things settle down & with most of our 400 mile journey being on the M6, M1 & M25, the Compass performed superbly as a motorway cruiser, with the leather seats & soft suspension, offering up a very comfortable ride. Business users will want to know how economical the Compass is. The claimed combined consumption is 49.6mpg. 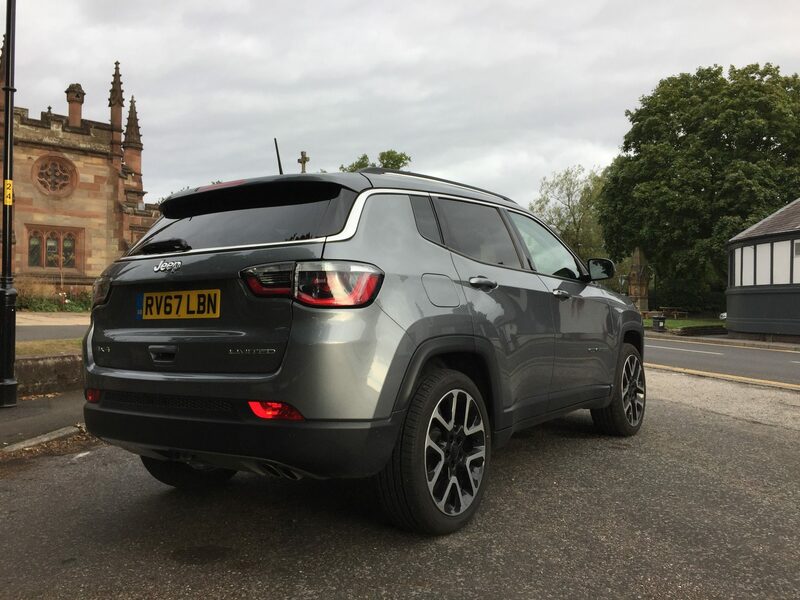 I travelled 500 miles in my week in the Jeep & averaged an impressive 40.1mpg, almost the same as I achieved in the diesel Mazda CX-5. As a comparison, the much praised Volvo XC40 in diesel guise, was 6mpg lower than the Compass.The Euro6 engine does come with relatively high CO2’s of 148g/km, compared to the Volvos 129g/km. In conclusion, whilst the Compass scores highly on it’s looks, it’s fuel economy, it’s equipment list & it’s comfort, it’s not as good to drive as the lighter Seat Ateca, Peugeot 3008 or Skoda Karoq, or is it as good inside as the Volvo XC40 or Volkswagen Tiguan, with the Swede & German ahead on build quality & styling. If you want or need a proper 4WD then the 2.0 litre Compass starts to appeal. I rather liked it, especially on the motorway. A Hit Me With Your Rhythm stick 3.25/5.